Sephora's Mattifying H20 Gel Primer: By the end of the school day, my face is always shiny. That problem is now solved with this primer. Before putting on your makeup in the morning, spread a thin layer of this around your face, specifically in your T-Zone. At the end of the day you may be wiped but your face will be shine free! Having makeup in my bag is important to me, but I will NEVER forget a water bottle and a snack! Having a full stomach and staying hydrated is just as much a priority as looking your best. 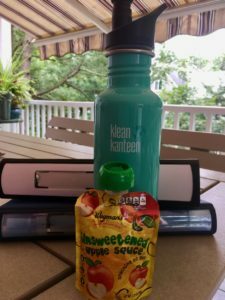 For my water bottle, I like to use a Klean Kanteen because it keeps my water cold all day, and for my snack, I like Applesauce Squeezes. And yes, I know, those are a backpack snack for a kindergartener, but I just love them!